The new Terminator movie has an official title, Terminator: Dark Fate. Last month Producer James Cameron revealed that they did have a working title for the film, which was Dark Fate, but nothing was official. Today it is. As you know Cameron rejoined the Terminator team after being away from the film franchise for a number of years. After making Terminator 2: Judgement Day, James stepped away from the franchise to make two of the highest grossing movies in cinematic history, Avatar and Titanic. He has come back to put some of his magic on Terminator movies once again. Terminator: Dark Fate is slated to be the start of a trilogy of new Terminator sequels. 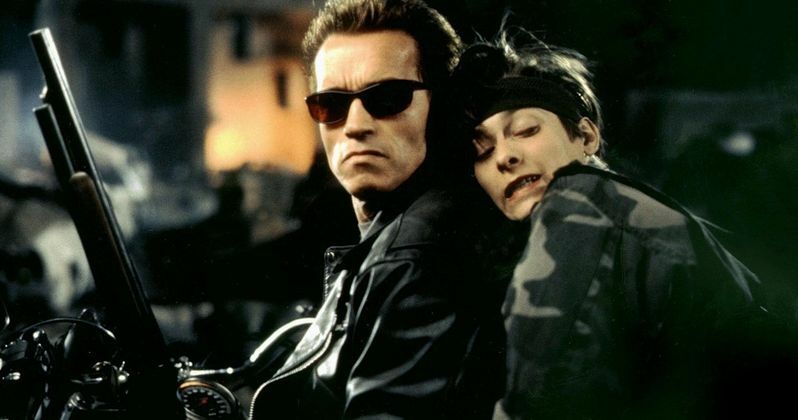 The studio also sees it as a direct follow-up tol the very last one Cameron headed, Terminator 2: Judgement day. So the current storyline seems to be an attempt to clear up the muddy stories that happened in between while James was gone making other movies, giving Terminator a sort of fresh start for the next coming films. Cameron will be producer as well as a creative consultant, or creative godfather to guide the movies into the future. He sees this Terminator movie as a way to introduce new characters for a whole new generation of Terminator fans. "I'll be back". Yes he will. We already saw Arnold return to his role in the last film, but how could we not be excited when it was announced and confirmed that he would indeed be in the new Terminator: Dark Fate. Just as interesting to fans was the announcement that Linda Hamilton will also return to appear in this newest installment. Once again, we don't know how they will play into the whole film, because the story is just the beginning of three adventures to be made in the series, so how they will carry on in the trilogy, or if they will carry on in the trilogy at all, we just don't know. Tim Miller is directing the film. He did Deadpool, which was his first major film credit as director. From seeing his work, he will be more than be able to handle the scope of the story involving the characters in this new Terminator movie. Terminator 6 has an opening date slated for November 1st 2019, which will put the movie in direct competition with another big opener that same day, Charlie's Angels. Charlie's Angels has been picked to open on Nov. 1st because it's the same date the original movie debuted some 19 years ago. Now the problem here may be that Charlie's Angels seems to share the same demographic as the Terminator movies, more specifically, older males. The studio is more than sure that the Terminator: Dark Fate will pull in a huge crowd, so they are not likely to move the opening date around. The question being will it lend to a smaller box office for the Charlie's Angels premier? If the marketing guys think so, well, we may see some movement in the opening date for that film as the Terminator: Dark Fate opening will certainly take precedence when it shows starting Nov 1st of this year. This news comes from Deadline.